Sluggish economic activity in China and falling oil prices triggered a steep decline among Asian stock markets during Monday's early trading. Investors pulled out of the markets after a private survey showed China's manufacturing activity in July falling to its lowest levels in two years. Economists say that suggests more rough water ahead for the world's second largest economy. 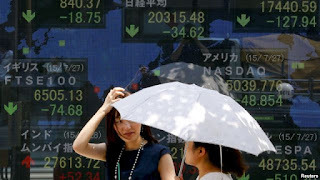 The Shanghai index slumped over 1.5 percent, while Seoul's Kospi index dropped nearly one percent, and Hong Kong's Hang Seng index lost as much as one percent. The fallout in Asia follows last week's across the board losses on U.S. stock markets. Friday ExxonMobile and Chevron, the two largest publicly traded energy companies, fell 5 percent each after posting major declines in profits from last year.